It was a mild October morning when I set off for a day’s fieldwalking at Branxton. What better way to spend a birthday, I thought. Hmmm . . . I imagine there are many who would not agree with me but I was happy to do so. We were searching a field at Branxton Moor farm believed to be on the route followed by the Scottish army on its way to the Battle of Flodden in 1513, exactly 500 years earlier. The field had already been marked out by more experienced volunteers and professional archaeologists were close at hand providing supervision and guidance. Fieldwalking may sound tedious – walking slowly in straight lines up and down a field, picking up anything which looks man-made and placing it in a plastic bag labelled with the exact location. And of course, if finds are rare, it can be very tedious. Yet, it is strangely addictive. It is difficult to dispense with the feeling that the very next step may provide sight of a precious item, even when the previous hour has yielded precisely nothing. On this occasion we volunteers were motivated by the possibility of finding coins, badges, buttons, etc., once the possession of Scots soldiers and accidentally dropped as they marched towards the field of battle 500 years earlier. For the first half-hour I found nothing at all despite scanning the ground carefully, willing something significant to appear. 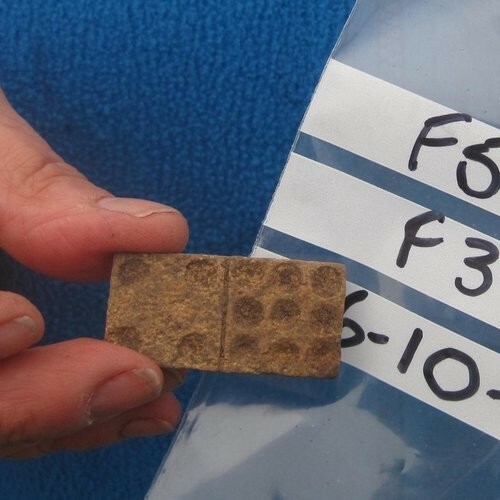 Then I casually picked up what appeared to be a small piece of modern building material with a distinctive patterned surface. “Is this anything?” I asked a more experienced volunteer. “It looks like a domino”, she answered. And so it was! The professionals were quickly called upon for their opinions and identified it as a domino made of bone. Interestingly, one half had 9 spots rather than the usual 1-6. Could this piece have belonged to a set belonging to a Scot enjoying a game for relaxation the night before the battle and possibly before his death? The find was duly photographed and bagged to be washed and cleaned later. I felt it was a very fortuitous discovery on my birthday! I would like to be able to report that during the rest of the day we came upon some more pieces from the set but sadly we did not. However, it was the most significant find of the day. Meanwhile on returning home, I set to work on the internet. My knowledge of dominoes was virtually non-existent so I had much to learn about their origins. As they are relatively simple objects I had imagined they might be very ancient in origin, dating to Roman or Greek civilisations or possibly earlier. I was wrong. The first known written reference to them appeared in 13th century China. They did not emerge in Europe until the 18th century in Italy and it is speculated that Italian missionaries visiting China may have brought them back to Italy. In a stroke the possibility of them lying in that field since the time of the battle was ruled out! Dominoes reached Britain by the late 18th century and may have been brought over by French prisoners of war. European sets are designed rather differently from the original Chinese ones and there are many variations. They became very popular in the 19th and 20th centuries and have since spread to the rest of the world. I felt very pleased to make my discovery and did not mind at all that it had had a shorter residence in that Branxton field than originally hoped!